Follow these before, during, and after instructions to keep your family safe in the event of extreme heat. In flood zone areas, the National Fire Protection Agency (NFPA) requires that large above-ground and underground propane tanks be anchored securely to avoid potentially dangerous situations. 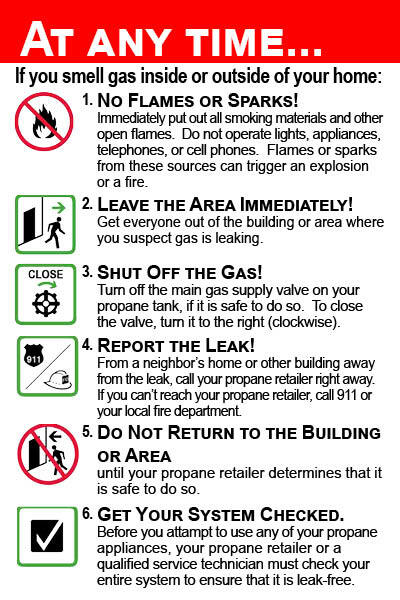 MAKE SURE YOU AND YOUR FAMILY KNOW WHAT PROPANE SMELLS LIKE. Propane has a strong, unpleasant smell like rotten eggs, a skunk’s spray, or a dead animal. It is recommended that you consider installing a carbon monoxide(CO) detector listed by Underwriters Laboratories (UL) on every level of your home. Be sure to follow the manufacturer’s instructions regarding installation, location, and maintenance. Floods can damage your propane equipment. A large propane tank can become dislodged from its service line and float away, striking trees, vehicles, or other heavy objects along its path. Also, water and debris can find their way inside regulators and controls, causing potential safety issues. In addition, fallen trees and power lines can create extra safety concerns. Use caution when returning to your home or farm. If you have any doubts about your safety, leave the area immediately and have your property inspected by a qualified building inspector or structural engineer before re-entering. Take the time to carefully evaluate the condition of all the structures on your property. If it is dark, use flashlights, not candles. Look carefully around the entire area. Check for downed powerlines; they can create major safety hazards. Floods can move, shift, or damage gas lines and tanks. Immediately call your local utility company or propane retailer if any of these hazards exist.